Two of Roy Budd’s funkiest jazz scores from the golden era of seventies film making. Previously unavailable, both soundtracks are featured together in a two disc set. 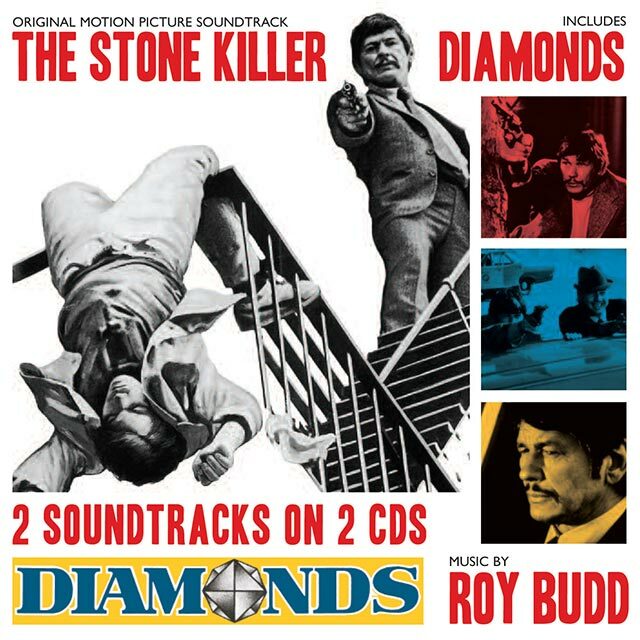 The Stone Killer (1973) underlines Budd’s incredible ability to integrate jazz and orchestral arrangements to deliver a score that is a perfect fit for the story of Charles Bronson on a trail of revenge. Diamonds (1975), a crime caper set in London, Jerusalem and Tel Aviv allowed Budd free range to mix Blaxpoitation themes, Jewish folk tradition and his own beloved jazz roots, all mightily topped off by the biggest girl group of the era, Three Degrees, performing the theme. Featuring Fender Rhodes keyboards, exotic percussion, laid-back flutes and big synth sounds, the soundtracks hail back to a time of masterful musicianship and prove Roy Budd equal to the giants of the 70s decade – Lalo Schifrin, Curtis Mayfield and David Shire. More recently, music on these releases has been sampled by a variety of artists that include Wu-Tang Clan, Snoop Dogg, Nas and LTJ Bukem.